"It was a joy to conduct this fine group of singers during their performances in Seattle and Portland," said Dr. Michael Busch. "Our audiences were obviously moved by their inspired singing and greeted us enthusiastically wherever we went." Who: The Concordia University Irvine Choir; Dr. Michael Busch, conductor. 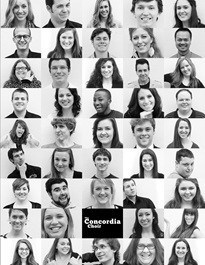 What: The Concordia Choir Tour Home Concert. Fresh from their concert ministry tour of the Pacific Northwest, The Concordia Choir presents their final tour performance at home in the superb acoustics of the Concordia University Center for Worship and Performing Arts. The repertoire includes a wide variety of great choral music featuring composers such as Brahms, Finzi, Gallus and Morten Lauridsen. They will also perform one of Eric Whitacre's newest compositions along with entertaining gospels and spirituals. When: Friday, March 8, 2013 at 7:30 pm. Tickets: $10 general / $8 seniors and students / CUI students free. Purchase tickets online or through our box office: boxoffice@cui.edu/949.214.3418. "It was a joy to conduct this fine group of singers during their performances in Seattle and Portland," said Dr. Michael Busch. "Our audiences were obviously moved by their inspired singing and greeted us enthusiastically wherever we went."